Sorry folks, I've had just too much fighting trying to post pictures this year. It's not worth it. I've moved over to Wordpress. I swear I will get the button changed off the homepage but until then just use the link in this post. When I was little, my Grandma always had a jigsaw puzzle on the table. Opening a new box of puzzle pieces usually has a familiar scent but not this one. There was no paper dust or fresh glue scent on this one. My son gave me a collection of 10 Thomas Kinkade puzzles for Christmas and I've been meaning to work on them. Today's Daily Challenge was to spend 5 minutes working on a puzzle of some sort. I opened the Kinkade box and this is what I found. None of the bags is labeled with the puzzle it contains. It's easy to tell which are the 2 100 piece puzzles. The other eight bags are all the same size. 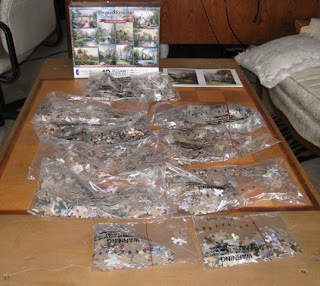 I've been able to use weight to determine which are the 300 piece puzzles and which are the 500 piece puzzles. As for determining which bag is which puzzle, it's just a matter of taking them out and turning the pieces. Once the corners are located it's pretty easy to see which puzzle it matches up with. When I put them away, they'll be labeled a lot better. In the meantime, I'm having fun not only putting together the pieces, but puzzling out which is which puzzle. You may yearn to utilize your innate resourcefulness today so that you can prove to yourself and others that you have been blessed with a creative streak. However, the skillfulness and cleverness you exhibit when tackling complex problems may actually be a product of a can-do attitude that never shies away from a challenge. 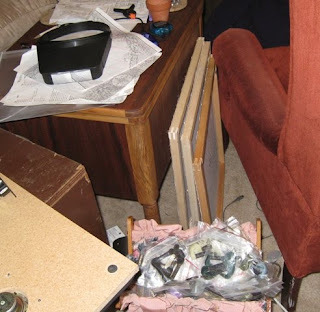 This can be the perfect day to plan an impromptu party or tackle repairs in your home, since the intricacy of each of these activities will likely provide you with a great deal of amusement. If you do feel your spirits begin to flag today, just remind yourself that no obstacle is insurmountable. We are capable of accomplishing almost anything when we believe that achievement is a matter of willpower as well as aptitude. Though we may discover that there are criteria we do not meet as we research the goals most precious to us, we should not let that dissuade us from pursuing our chosen paths. What we lack in experience or training, we make up for in a high level of dedication and a willingness to learn. However, if we want others to give us a chance, we must be forthright about both our weaknesses and our strengths. They will frequently respect us all the more for our honesty, and the regard we have gained in their eyes may be the catalyst that inspires them to take a gamble on us. When you believe that you can meet your objectives today no matter what your limitations, you will do what it takes to succeed without hesitation. Next to my chair. The thing is I'm getting tired of Winter both on my stand and outside my windows. 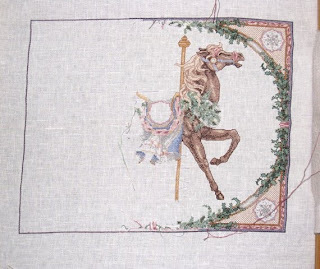 I'm starting to look forward to Spring - both the horse and the season. I'm also getting tired of 40 ct fabric and I'm wondering if I should work on something a bit larger like 18 ct canvas? In other words, should I work on a Needlepoint WIP for a bit or should I finish warping this puppy up? There's also an urge to grab something completely new. I'm quelling that urge because I have enough things going and I should finish the ponies before starting to love something new. Recently when our kitchen sink died, we looked at options for a different style of faucet. The new sink had 4 holes available two for the hot and cold taps, one for the faucet and one for a sprayer. However, the faucet I liked had a single tap, a faucet and the sprayer leaving space for a soap container or something else. We opted for something else - a hot water dispenser. The lucky thing is our RevereWare teakettle died a few days after we put in the new sink. So instead of putting on the kettle and waiting for the whistle to blow, I now turn the tap and get boiling water. Somehow it isn't the same experience. With the kettle there was a ritual. I would change the water and put it on the stove. Then I would select the tea - usually a citrus blend or a green with ginseng and get out the honey or artificial sweetener. There's anticipation in putting the kettle on and waiting. Now with the hot water dispenser, I put the teabag in the cup and turn the tap. The anticipation is gone. I still enjoy the tea yet it's missing something. I think it's the anticipation. 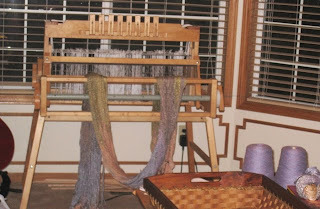 This is the twill sampler from my weaving class. It's 26 x 8 without counting the fringe. The patterns on it are pretty cool and making the picture web sized took out a lot of the detail. I spent my birthday money. Most of it went to Three Wishes. To let you know what is in the picture - The blue cone is a chenille of some sort. The other cone is a variegated lavender thread that has 22 wpi (wrap per inch) and isn't very strong so I figure I'll have to go at least 4 ply to use it. 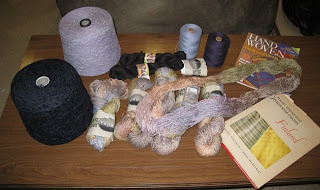 The dark skeins are a wool/silk/bamboo wrap with sequins in it from SWTC, the variegated is Tabali from Chile, the two spools are carpet weight yarn for me to play with and the latest issue of Handwoven which I got so I can decide if I want to subscribe. The book in the corner is a present to me off eBay. It's Hand Weaving patterns from Finland by Helvi Pyysalo and Viivi Merisalo. I'm using one of the patterns from it for my final project from class. Oh, that reminds me - my weaving class is also my birthday present. There's a reason I only take one new class every couple years. After all, I don't have hobbies, I have obsessions. Sharing my life and thoughts with anyone who takes the time to read. However, this is mainly for me. I own the content and like discussion and hearing ideas. Completed something for Finish it February!